FOUND has placed genuine pioneers with some of the most hot-tipped up-and-comers on the circuit today, delivering a 360 degree selection that looks to the clubs and to the clubbers for inspiration. Introducing a line-up for the true lovers of the very best in underground electronic music. 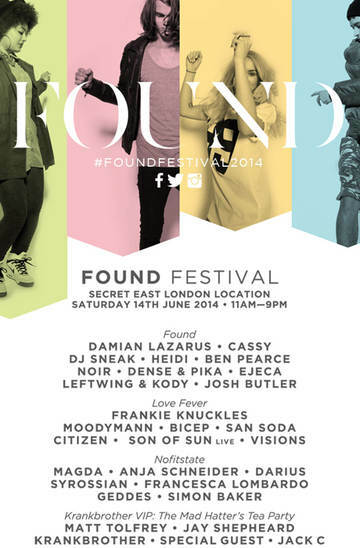 Once again the FOUND Festival will be followed by an epic London After Party, running through the night until 6am. An impressive event in its own right, the After Party moves to a new location for 2014. With four rooms of programming at one of the city’s grandest venues, the sunshine fuelled sounds of the Festival are set to give way to a darker, eclectic late-night offering. FOUND presents an international line-up of over 20 artists, featuring select talent from the Festival playing special sets, joining a host of new headliners and room hosts for the evening. For a sneak preview of whats to come this year check out the highlights from Found 2013…. we nominated Found as one of our WCM favourite events of 2013, we are sure you will agree it was a incredible event. For anyone who has not yet purchased tickets this event is guarenteed to sell out. We recommend getting your tickets now! Remember that attendance to the festival will also give you a reduced ticket rate for the afterparty. *Also dont forget to check out Ceremony forthcoming from the Found family. We will be giving all the latest news and updates about Ceremony very soon!